I have to admit this is one of my fav MB dies, so easy to use and so versatile and your result speaks for itself. Beautiful. Have a lovely weekend.. This die is so versatile, and works so nicely to inlay. It's always elegant, no matter what color you choose and your inlay is perfectly done! I like the dotty paper with the dotty embossing...it lets that pretty floral stem shine! Well done! TFS & Have a good weekend. Hugs & Prayers. Hello sweet Maxine, I love the die you have used and all the dots make it very pleasing and stylish. I am sure your friend will love it. Looks like we were thinking about the same die at the same time Maxine! This is so pretty and I do love the inlaid look with that die. Perfect card and so pretty. Love the two tones and the repetition of dots. Those inlaid poppies fit perfectly, CAStastic! Maxine, your card is beautiful! Love the way you added the sentiment. Gorgeous!!! This is so pretty and elegant, Maxine! The blue and white is so fresh and I like how the dotty paper matches the embossing. I love how the dots of the paper extend to the embossed dots, Maxine! The poppies look so crisp and I love the way you've done the sentiment! Thanks so much for sharing with us at CAS Mix Up! Fab design Maxine. I love how the embossed dots and dotted paper contrast but yet they go together so well. This is so beautifully balanced in design and colour! And I love blue/white dots... Hope you have a sunny weekend! Simple says so much - and this one is amazing. Love your colors and use of the die. Thanks for joining us at The House that Stamps Built. Simply sweet and lovely. I love cards that can be used for so many purposes. So glad you joined us at Morgan's ArtWorld. Simple and pretty! the lines on that poppy die really are beautiful and it looks really cool inlaid. Thanks for playing with the House That Stamps Built. This seems to be a popular die. I love it and love the card design you created to show case it. Such a pretty card Maxine--I love all of the dots and the inlaid diecut. I need to try that--thanks for the nudge! So pretty Maxine! I love the blue and white combination of the papers and inlay die cut. A very pretty card. 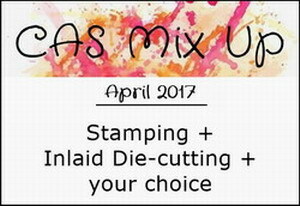 Thank-you for joining us at the Crafting with an Attitude Challenge 'Anything Goes' April 2017. Maxine, this is so elegant! I am loving seeing your creations on IG :) And did a double take with you and Lynn channeling each other! Big hugs to you, my friend! Wow, this is Awesome - thanks for joining us over at The House That Stamps Built. What a gorgeous color combination, Maxine. I also love the pressure embossed dots. I always forget about using my embossing plates. They add such great textures. Thanks so much for sharing your talents with us.